Over sixty years have elapsed since the Communists gained control of the Chinese mainland. The years between 1949 and 1969 were a time of constant change and periodic cataclysm-the initial purges, the Great Leap Forward, and the Cultural Revolution-all bound up with the Communist conception of how to move the country into modernity in the shortest possible time. The Chinese Economy under Maoism summarizes and evaluates the economic consequences of the Communist path to development in a concise, factual presentation that can be readily comprehended by non-economists. 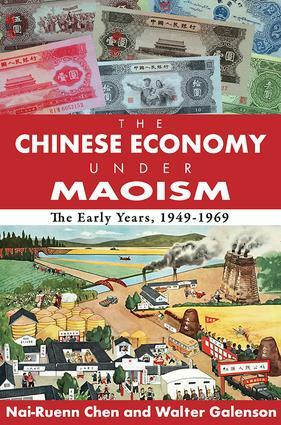 The authors review the major features of the Chinese economy prior to the Communist takeover and discuss the policies, performance, and problems of the individual sectors of the Chinese economy during its initial years under Communism. Included in their review are industry, agriculture, foreign trade, resource allocation, population, employment, and living standards. A concluding chapter summarizes Chinese economic growth and presents a discussion of future policy alternatives and an optimum economic policy for China. Based on important findings of Western scholars, with many original interpretations by the authors, this material is presented from a developmental point of view. Since it was originally published in 1972, sections of the book devoted to comparative studies of progress in India and the former Soviet regime will be of particular interest now. Free of technical language and providing insights into the economy of one of the most important countries in the world, this book will be useful not only to economists but to a broad range of sinologists, political scientists, sociologists, and historians interested in the path of revolution.